Buy online 200 sq. ft. Roll of Silicone Vapor Shield Underlayment for Wood Floors 70-198 and leave review or share with Your friends. 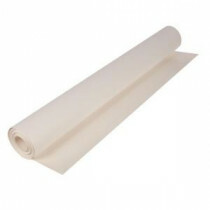 The Roberts SVS Silicone Vapor Shield is an underlayment that is in a class by itself. Our SVS is made of 6 mil wet strength paper and has a baked silicone coating that won’t allow moisture to penetrate though to your hardwood and engineered wood floors. It is ideal for staple and nail down installations. The proprietary manufacturing process produces a strong product that will not fall apart like red rosin, craft and wax papers do. Our SVS has been vigorously tested under multiple conditions for moisture permeability and is proven to be far-and-away the best rated underlayment paper for moisture protection. SVS also meets the recommended perm guidelines as set forth by the National Wood Flooring Association (NWFA). The two sides of SVS make it easy to install with the matte finish down and the smooth surface up which allows installers to easily mark chalk lines and slide wood planks easily into position. Radiant Panel Association lab tests have confirmed that SVS is also suitable for use on radiant heated floors and has achieved accolades from the Radiant Heat Association. Our SVS is made in Canada with 100% recycled contents.